Former Prime Minister Raila Odinga has hailed Makueni County voters for electing Cordâ€™s Mutula Junior as their new senator. Mr odinga also congratulated the Wiper Democratic Party and CORD leaders for the firm stand that ensured the coalition clinched the seat. Mr Odinga thanked the youth who poured in Makueni in their thousands to stand with one of their own, Kilonzo Junior , and to ensure Cord won the seat . The former PM also thanked Mutula Kilonzo Junior’s sister Kethi Kilonzo for her fight for Makueni seat, which was frustrated by Jubilee, saying it inspired Makueni residents to come out in their thousands to make their intentions known. ” I have just received good news that the Makueni people have elected Cordâ€™s Mutula Junior. I am very happy that the Makueni people have confirmed to the doubting Thomas that they are still ardent supporters and member of the Cord as many majority Kenyans areâ€™ he said . “I congratulate Junior. I congratulate the Wiper Democratic Party and the CORD fraternity for refusing to budge. This victory shows our future lies in standing together especially in times of trial, and Makueni was a big trial on our resolve and our unity,” Odinga added. Referring to the struggle that pushed Kethi out, the former PM said the young lawyer remains a critical member of the Coalition going forward and asked her to stay focused and support her brother and the party, adding that CORD believes Jubilee will never forgive or give her rest but the party will stand with her and the family. Mr Odinga said CORD is determined to hold the hands of the youth and lift them to key leadership positions as shown in the coalitionâ€™s fight to put a young man in a critical Senate seat after Jubilee ruined her sisterâ€™s chances. He said the election of Kilonzo Junior is a win for the forces of Devolution that are determined to ensure all regions of Kenya get a fair share of the national cake out of the taxes they pay. The former Prime Minister spoke during a dinner party organized for him and his entourage that included governors by Kenyans residing in Texas, a head of a two day summit between the County Chief Executives and key investors. He challenged Kenyans living in the Diaspora to help County Governments stabilize economically by investing in the country. 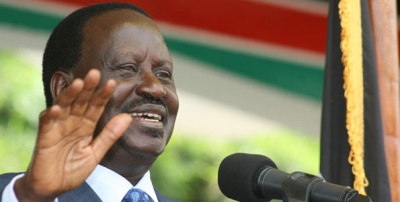 Raila said the country new system of governance will succeed in alleviating poverty if Governors got support from Kenyans in the Diaspora through â€˜back home investmentsâ€™. â€˜The foreigner investors we are looking for every time will only play a minimal role in spurring economical growth of our county economies. Some investors will invest with a setmind that part of the profits they will make, must go back to their mother countries but if a Kenyan invests back home that is a win win situationâ€™ Raila told a team of Kenyans in Dallas, Texas in the USA. The former PM spoke on Friday Said he â€˜Kenya can only be built by Kenyans themselves no matter where they areâ€™ he said. The Cord coalition leader was accompanied by Governors among them John Nyagarama (Nyamira, Alfred Mutua (Machakos) Josephat Nanok (Turkana), David Ngetiany (Kajiado), Cyprian Awiti (Homabay), Ranguma (Kisumu), rasanga amoth(Siaya),James ongwae(Kisii) Amason Kingi (Kilifi)and Sospeter Ojaamong (Busia. Speaking on behalf of the two day summit organizers, Raphael Atore dispelled fears that his group was harbouring political agenda in inviting only Cord allied governors. “We have no political agenda. We are not here to campaign for Raila Odinga or party as such but we opted to invite Cord Governors because of their being in the opposition. As Opposition allied leaders they will carry out investments transparently bearing in mind their roles as the ruling coalitionâ€™s watchdogsâ€™ he said. He said the organizers had invited leading investors to interact with the governors and agree on best partnership modalities. â€˜ our main focus as Kenyans in the Diaspora now is to help our governors come up with means of at least reducing poverty rated as being the highest in Nyanza and North Eastern and Eastern parts of the Countryâ€™ said Ochieng. He added â€˜ours is to revolutionalise management of development matters for the better Kenya under devolutionâ€™ he said. After the Dallas meeting Raila will lead his entourage to three other States in the USA.